The good news is many orchids do not require the hot, steamy weather found in the tropics. They'll do just fine in the temperatures found in most homes. So if you feel comfortable with the temperatures in your home, there are many types of orchids that will too. Many orchids thrive in the same temperatures we live in. Even though many orchids will grow in the same temperatures that we live in, getting them to bloom is a different story. Triggering a bloom cycle means simulating a 15-20 degree difference between day and night temperatures these plants experience in nature. Don't worry, you don't have set the thermostat for a 20 degree drop in temperatures every night to get your orchids to bloom! Understanding the micro-climates in your home helps solve the problem. You can easily tell whether a room is hot or cold by simply standing in it. Understanding temperatures from a plant's perspective isn't quite that simple however. Temperatures throughout a typical room can vary a lot. This is especially true near windows - where plants grow. These small spaces are called "micro-climates". Conditions in micro-climates can be very different from the rest of the room. For example, take a closer look at the micro-climate near a window. When the weather outside drops below freezing in the winter, the temperature next to the window could be in the 50's. When the sun streams in the window during the day, the temperature in that same spot can soar to over 90 degrees - even during winter months! A good way to identify the temperature range in the micro-climates in your home is with a "Hi/Lo Thermometer (also called a "maximum/minimum thermometer). 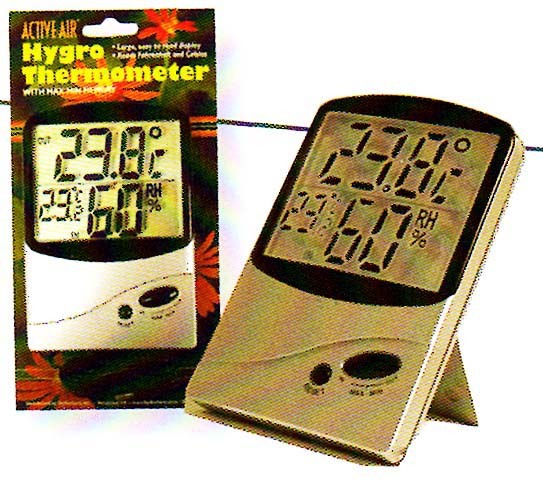 Our Hi/Lo Thermometers show the current temperature, the highest and lowest over time, and the relative humidity.